The Winter Olympics start this Thursday. Yeah, that's right. In a weird twist meant to keep us all on our toes and confused and a little upset judging by most people's reactions, the events start Thursday before the Opening Ceremonies. I'm...sort of okay with it, because I've been looking forward to the Olympics and this means one less day of waiting. Plus, one of the first events is Team Figure Skating...it's the first time this event will be included in the Olympics and I'm really curious to see how it all goes down! These particular Olympics have been met with some controversy. Apparently, there was lots of corruption in the planning. There are numerous terrorist threats causing concern for athletes and their families. They have to stockpile snow because Sochi is not actually that cold. And of course Russia's anti-LGBT laws that have led to many an unfortunate athlete interview as reporters eagerly rush to put them on the spot. I feel like the press has been so negative about the Games that I wanted to highlight a few exciting things! *2002 was the first time there was a black Winter Olympic gold medalist (!!!) and it was in bobsled. This year, five African American women are on our bobsled team! So the diversity continues there. So there's that. Anyway, I will be watching as much of the Olympics as I can, but this is a crazy busy month for me. This week is sort of the calm before the storm! I have some posts about figure skating lined up for the week, but as a sort of intro I thought I'd share some links. There's a lot being written about it right now in the run up to the Games. Also, this year marked the 20th anniversary of the Tonya Harding/Nancy Kerrigan incident which led to some of my favorite sports writing ever being produced (but more on that later in the week). So. Last week there were two posts about figure skating and how everyone is still in the closet...I'm not a huge fan of either piece to be honest, and I'm not sure the timing is right for the sport...it's definitely right for the journalist, though, lol. Anyway, they do both bring up some interesting points and I'm not about to say it's NOT a problem or anything like that. They are throught provoking reads in that regard. Both seem to especially focus on men, cheerfully ignoring any issues women might face with regards to rigid gender roles in the sport. *Buzzfeed--Why is the World's Gayest Sport Stuck in the Closet? The Washington Post had this delightful piece, I'm Black, I'm a guy. And I'm obsessed with figure skating. Which I loooooved. I have a huge soft spot for anyone who became a fan when I did and in the same way. Basically, Kristi Yamaguchi. And lol, I totally "skated in the house" on socks when I was little and also tried to do pretend jumps and stuff with my actual skates which argh. Anyway, a delight to read! Like figure skating costumes? There are a ton of round ups of costumes through the years being posted right about now. Figure skating blogs you say? Well I really only read a few. *Kelli Lawrence's State of the Skate --she mostly recaps competitions and makes predictions for them. She's also the author of Skating on Air! *Is that a Skate Guard in Your Pocket or are You Happy to See Me? (lol the name, I know)--this blog has a lot of interviews, info about skating history, and thoughtful commentary on the loss of artistry in skating. *The Skating Lesson--they also make vlogs (which they call podcasts? Am I like...just totally out of internet lingo these days? Are video blogs now also podcasts?) They have a few vids about the IJS and take a fun, gossipy, slightly conspiratorial angle on all things. But they are pretty fun to watch, though it seems Jenny may have disappeared for now. 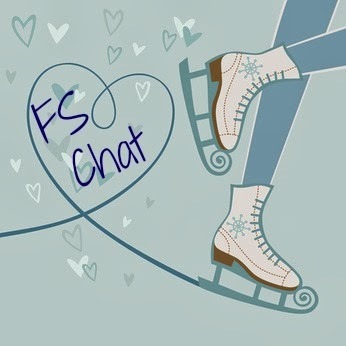 *The USFSA has a headquarters page where you can find all the skaters Twitter handles and the latest news and such. *I also often check out Blazing Blades for figure skating news. So...if you want to brush up before the Games, I hope there's some helpful info here. It's all a bit daunting as I recently went through this during the Fall myself! Okay, I do want to have a chat, so! Question of the day--what is your favorite figure skating discipline and who is/was your favorite skater? For me, it's really hard to choose between dance and pairs. I think there's something so romantic about them both and some of the elements in pairs are just jaw dropping. Also, I'm really kind of fascinated by the idea of those working relationships and how if the other person messes up your Olympic dreams could be down the toilet. There's an intense kind of intimacy involved that's a little bit different from being on like a team as in baseball or football. It's fascinating, okay?